Steel Legend represents the philosophical state of rock-solid durability and irresistible aesthetics. Built around most demanding specs and features, the Steel Legend series aims at daily users and mainstream enthusiasts! Providing a strong array of materials/components to ensure a stable and reliable performance. 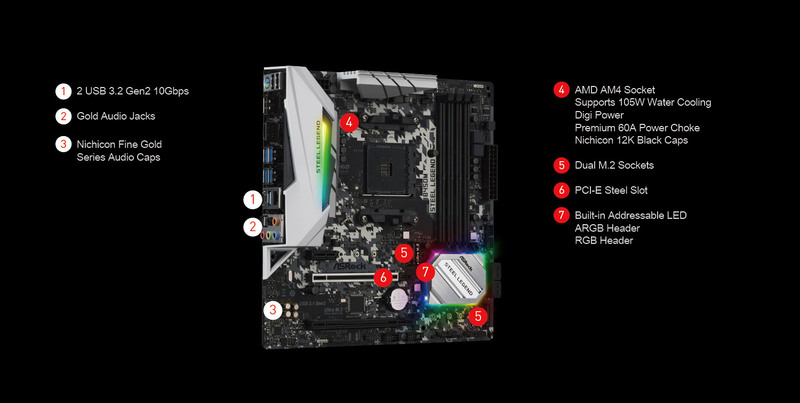 A motherboard that fulfills every task – with style! Click here for more Motherboard. EX-H310M-V3●︎ Non-stop action: The best choice for iCafé, configure-to-order gaming systems and qual..
MSI B450M PRO M2 V2 ●︎ Supports AMD® Ryzen 1st and 2nd Generation/ Ryzen™ with Radeon™ Vega Gra..
B450 GAMING PRO CARBON AC●︎ Supports 1st and 2nd Gen AMD® RYZEN™ THREADRIPPER™ Series Processors●︎ S..
B360M BAZOOKA●︎ Supports 9th / 8th Gen Intel® Core™ / Pentium® Gold / Celeron® processors for LGA 11..
MEG Z390 Gaming EDGE AC●︎ Supports 9th / 8th Gen Intel® Core™ / Pentium® Gold / Celeron® processors ..
MSI Z390-A PRO●︎ Supports 9th / 8th Gen Intel® Core™ / Pentium® Celeron® processors for LGA 1151 soc..
ASUS Prime A320M-K AMD Ryzen●︎ Powered by AMD® Ryzen™ AM4 and 7th generation Athlon™ processors to m..